The secret to get a good espresso is using freshly ground, high-quality Italian coffee. The coffee pad system is based on this very principle. The ground coffee is enveloped in a filter made of biological food paper (pad). The pad, vacuum-packed with addition of nitrogen, is inserted into a single aluminium sachet. Users no longer have to waste time to remove the coffee leftovers from the base, the filter, the nozzle and the grid once preparation is over. They also no longer have to touch the coffee mix with their hands. 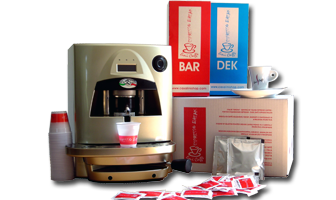 The cleanliness which is intrinsic to the pad system also allows to drastically reduce the periodic cleaning of the espresso machine, required to ensure proper operation and preserve the beverage aroma. The pad system is environment-friendly: each pad consists of about 7 grams of coffee and 0.2 grams of paper: two natural and environment-friendly products. Coffee is perfectly dosed during the industrial process and sealed in the filter paper. As a consequence, product doesn’t risk to get wasted, as it generally happens when using ground coffee, due to overdosing or to product loss during handling. The machines, of course, are not manufactured by us, but we have thoroughly tested them for optimum use with our pads. We have a wide range of models meeting different requirements: espresso only, espresso and steam for cappuccino; with 1, 2, or 3 units for 1 or 2 espressos, particularly designed with the catering sector in mind.